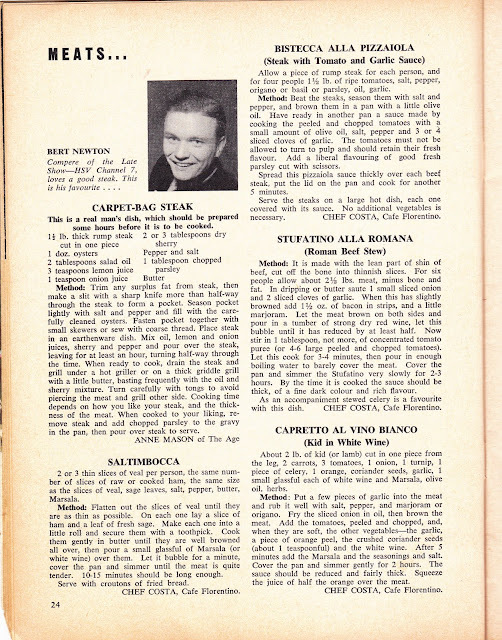 I'm getting a bit scan happy and thought i'd delve into some of my more interesting vintage cookbooks and pamphlets. 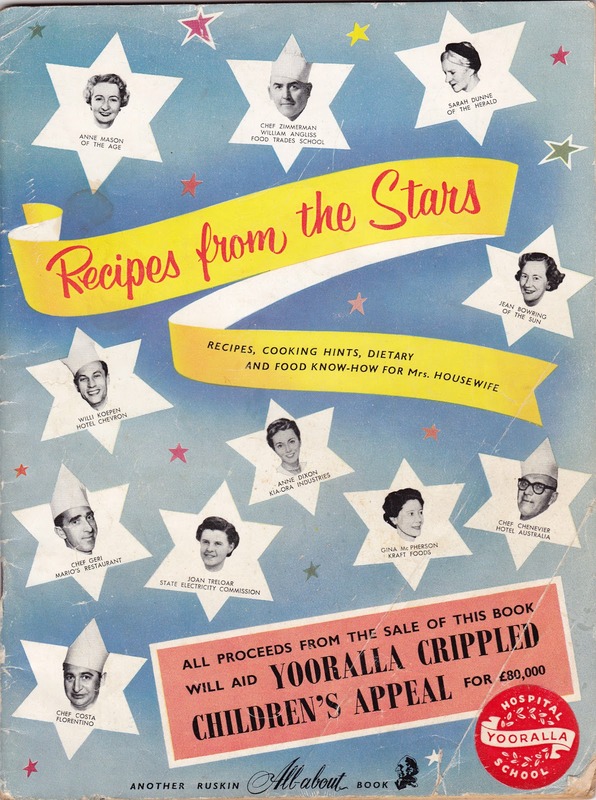 "Recipes from the stars" appears to have been put out in the late 50's to benefit the Yooralla crippled childrens appeal-see Yooralla's history here. An array of temptations are included, as chosen by the big Aussie stars of TV and radio, along with some tips n' tricks from chefs and food writers. A babyfaced Bert Newton's pick is carpet bag steak, a particularly horrifying combination(well, as far as i'm concerned-being vegetarian) of steak stuffed with oysters, bacon wrapping optional. Anybody sampled this delicacy? I've been assured it's really not that outrageous and something of an Aussie favourite, but y'know, having not eaten meat in 12 years has put blinkers on me in regards to this stuff. "GEORGE NEGUS: In those days, television was like radio with pictures for somebody like yourself, wasn't it? BERT NEWTON: I think we all thought it would be that way. I remember, as that young kid at 3XY, they were talking about television arriving in Australia. I assumed it was going to be an announcer sitting there and chatting, very much like this. GEORGE NEGUS: Yes – old-fashioned television. BERT NEWTON: But playing records. And I used to think, "I wonder what they'll do when they play records. Will they just go into a turntable or whatever?" And of course, we discovered eventually it was much more than that. That was the exciting time for me and for everybody else who was in it, because nobody knew anything about it. The people who actually were the chief engineers and the, um, program directors and general managers had no more than four weeks experience over in America, invariably at the Cleveland, Ohio, television station, for some reason. They all graduated from there after four weeks. So the floor managers, the cameramen, the announcers, the singers were all learning together. GEORGE NEGUS: Making it up as you went along. BERT NEWTON: Yeah, and the audience didn't know any better, so absolute rubbish was looking quite good to them." Really talking it up there... gotta start somewhere! Here's the intro followed by a pretty neat live coke add ending in Berts satisfiably quenched approval.